Thank you so much, Ronnie. We heard compliments on the ceremony all afternoon. It was perfect! - Branden H.
Looking for your wedding officiant? Hi! Thank you for visiting my website. I believe you should have your ceremony, your way. I am professionally trained, formally ordained interfaith minister, with a working knowledge of many different religious traditions, including the similarities and differences between each. As a result, I can perform ceremonies that reflect your religion of choice, blend together your spiritual paths, or create a truly personalized ceremony that reflects your values, beliefs, paths and desires. I am often asked by couples who consider themselves to be "spiritual but not religious" to write ceremonies that join their individual beliefs into a ceremony that is meaningful, truly heartfelt and very personal. the months of May through October, to confirm availability. ​I routinely book as far as 1.5 years in advance. 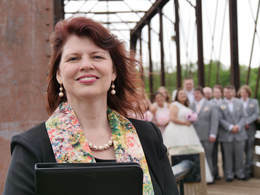 Do you have questions you'd like to ask a wedding officiant? Thank you for visiting my website! I hope you find the answers you're seeking here. If not, please feel free to contact me for more information, availability, ideas, etc. I'm here to serve.